The Dene is a family of Indigenous peoples that occupy the western subarctic region of Canada. They are Athapaskan speaking and include such groups as the Chipewyan, Dogrib, Hare, Kutchin, Tutchone, Tahltan, Beaver, Carrier and Slavey. Their environment is quite harsh with severe winters and short summers. Some of the area is forested, but a lot is tundra: a vast, level of treeless plain in the arctic regions. The ground beneath the surface of the tundras is frozen even in the summer (known as permafrost).tundra. The mainstay of the Dene economy was the caribou.caribou: any of several kind of North American reindeer. It was the main source of food and also provided materials for clothing, tools and housing. Other animals were hunted, too, like the moose, the musk-ox and rabbit. Fishing supplemented the diet. Food was not as plentiful as it was in the south and starvation and death from the cold were constant threats. Farther west, where there were forests and ocean-bound rivers, groups like the Carrier had more access to food, particularly salmon, and therefore could be more settled. 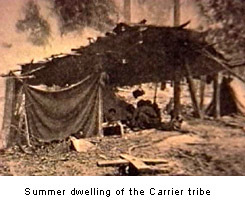 Housing varied from dome-shaped tipis covered with skins to dugout pit houses and cabins or lodges built from poles. The dwellings were usually banked with snow and insulated in winter. For most of the Dene, life was very nomadic: people who move from place to place in search of food or fresh grazing lands.nomadic and dwellings had to be easy to transport. Travel during winter was on foot with snowshoes and toboggans. In summer, light bark-covered canoes were carried on trips to be used when they came to navigable lakes and rivers. The main social unit was the family. Several families travelled together in small groups although occasionally a summer camp of up to 600 people might come together. Because hunting was the most important activity and the people were highly nomadic, men were very dominant in the society. Girls entering puberty and menstruating women were isolated because it was feared they would displease the hunting spirits. Individuals had a lot of freedom. Chiefs were chosen for their ability and only for temporary purposes and their leadership was not absolute. Religious beliefs centred on the all-important relationship between hunters and animals. Hunters were given "medicine bundles" at childhood and they slept with these for supernatural aid. Because of the mobility of the society, the aged and infirm were left behind to die and bodies were often left unburied with a few possessions to take with them on their journey to the afterlife.